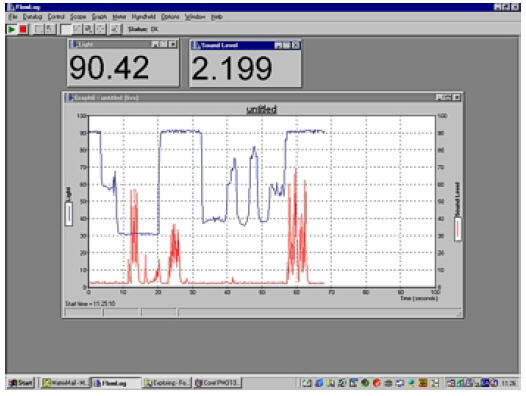 Comment: Flowlog is a low-cost data logger and control device that distinguishes itself by working with the Palm / Dana handheld computer as well as a PC. Its use of an infra-red link is novel but the bigger appeal is that pocket organisers reduce the overall cost. 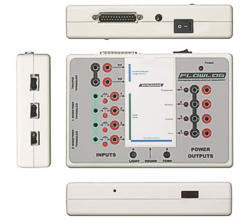 As well as data logging, Flowlog has D&T uses as a storage oscilloscope, circuit board tester and control technology interface. There are two models, one boxed to use plugs and one ‘bare board’ version using screw terminals. Has a huge range of sensors from US supplier Vernier, it begs a trial. Pros: low cost. Will surely be of interest to D&T departments in schools. No need to wait for new sensors as the kits uses the established Vernier range. The software imports and exports SID files so that data can be exchanged. Future proof rating: a first and impressive entry into data logging for Matrix Multimedia. Uses well established sensors. It is uncommon to get in any way excited about a data-logger. But if you take "measuring and control" in the science and technology curriculum seriously, you may find you need a lot of equipment - like sets of loggers and computers. Flowlog - an inexpensive logger from Matrix Multimedia ought to generate some excitement. To earn its keep in science, it records data from experiments. In technology it works as a unit that switches things on and off in control projects. 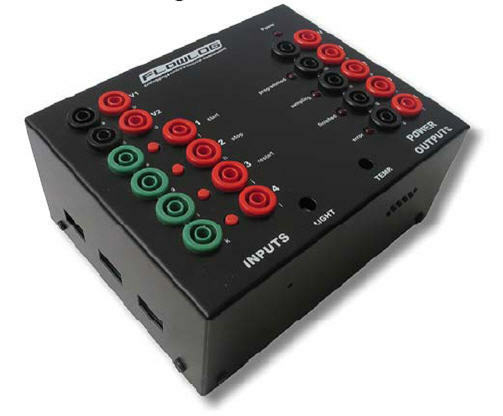 And for electronics it provides a powerful two-channel oscilloscope. With its low price this feature-packed logger is so affordable it ought to cause a stir. Coming in two varieties, the Lite version is an open circuit board with built-in sensors, sockets and screw terminals. 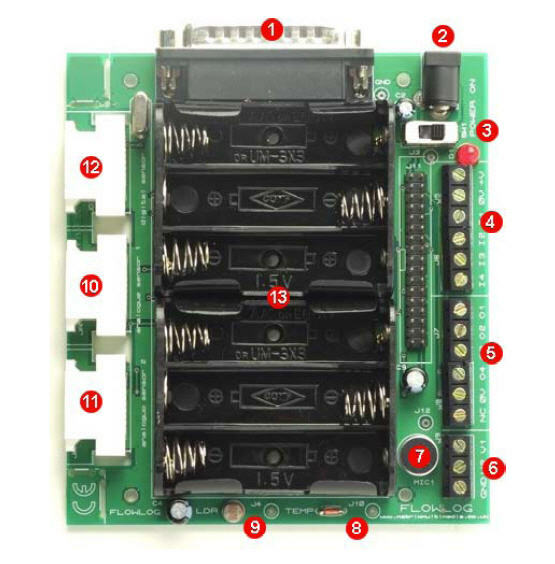 With these you can power motors, attach switches or even wire in the sensors that many schools have. What the unit can then do technology-wise is rich in scope. If you've any doubt, dozens of sensors are available to measure current, force, pulse and so on. For another £150, Flowlog comes as a boxed Standard version that feels more presentable in science and replaces the terminals with "banana-plug" sockets. It can be charged up like any other logger, set to take experiment readings or even put in a greenhouse to record. With the features of a logger, control unit and 'scope, the software supplied does more than you asked for and manages a few tricks like very fast measurement or recording 12 sensors at once. Its menus are cavernous, but there's an upfront wizard to take you through the main tasks. If you care not for using a PC, the unit works with the Palm, a shirt-pocket-sized computer than can be bought for as little as £75. It is a remarkable feat, as with this you can use a wireless infrared link to send instructions or data between the Flowlog and the Palm, a star of the pocket diaries. I don't recall anything as slick or offering "class set" potential for so little money. Those teaching technology or ICT, and keen to set pupils challenging projects will find unusual capability in Flowlog. For science the unit feels idiosyncratic and I think that it is close to solving too many problems at once. However, if the price and the mass of features conjure some excitement, Flowlog is an option to investigate.